The ozone layer is a layer in Earth's atmosphere that contains relatively high concentrations of ozone (O3). It is mainly located in the lower portion of the stratosphere, from approximately ten kilometers (km) to 50 km above Earth's surface, though the thickness varies seasonally and geographically. The actual ozone concentration in this layer is only about a few parts per million, which is small compared to the main components of the atmosphere, but it is much higher than the concentrations of ozone in the lower atmosphere. The ozone in this layer absorbs most of the Sun's high-frequency ultraviolet (UV) light, which is potentially damaging to life on earth. It thus serves a protective function. Recently, however, there has been concern that the ozone layer is being depleted by reactions with free radicals derived from certain manmade chemicals (such as chlorofluorocarbons (CFCs)) released into the atmosphere. Use of these chemicals is now strictly regulated or prohibited in a number of countries, and the ozone depletion rate appears to have slowed down. The ozone layer was discovered in 1913 by the French physicists Charles Fabry and Henri Buisson. Its properties were explored in detail by the British meteorologist G. M. B. Dobson, who developed a simple spectrophotometer (the Dobsonmeter) that could be used to measure stratospheric ozone from the ground. Between 1928 and 1958, Dobson established a worldwide network of ozone monitoring stations that continues to operate as of 2008. The "Dobson unit," a convenient measure of the total amount of ozone in a column overhead, is named in his honor. It has now been estimated that more than 90 percent of the ozone in Earth's atmosphere is present in the ozone layer. 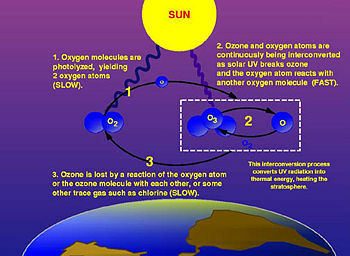 Ozone-oxygen cycle in the ozone layer. The photochemical mechanisms that give rise to the ozone layer were worked out by the British physicist Sidney Chapman in 1930. Ozone in the earth's stratosphere is created by ultraviolet light striking oxygen molecules containing two oxygen atoms (O2), splitting them into individual oxygen atoms (atomic oxygen); the atomic oxygen then combines with unbroken O2 to create ozone, O3. The ozone molecule is also unstable (although, in the stratosphere, long-lived) and when ultraviolet light hits ozone it splits into a molecule of O2 and an atom of atomic oxygen, a continuing process called the ozone-oxygen cycle, thus creating an ozone layer in the stratosphere, the region from about ten to 50 km (32,000 to 164,000 feet) above Earth's surface. About 90 percent of the ozone in our atmosphere is contained in the stratosphere. Ozone concentrations are greatest between about 20 and 40 km, where they range from about two to eight parts per million. If all of the ozone were compressed to the pressure of the air at sea level, it would be only a few millimeters thick. Levels of ozone at various altitudes and blocking of ultraviolet radiation. Although the concentration of the ozone in the ozone layer is very small, it is vitally important to life because it absorbs 93-99 percent of the biologically harmful, high-frequency ultraviolet (UV) radiation emitted by the Sun. UV radiation is divided into three categories, based on its wavelength; these are referred to as UV-A (400-315 nm), UV-B (315-280 nm), and UV-C (280-100 nm). UV-C, which would be very harmful to humans, is entirely screened out by ozone at around 35 km altitude. UV-B radiation can be harmful to the skin and is the main cause of sunburn; excessive exposure can also cause genetic damage, which can result in problems such as skin cancer. The ozone layer is very effective at screening out UV-B; for radiation with a wavelength of 290 nm, the intensity at Earth's surface is 350 billion times weaker than at the top of the atmosphere. Nevertheless, some UV-B reaches the surface. Most UV-A reaches the surface; this radiation is significantly less harmful, although it can potentially cause genetic damage. UV-B energy levels at several altitudes. Blue line shows DNA sensitivity. Red line shows surface energy level with ten percent decrease in ozone. To appreciate the importance of this ultraviolet radiation screening, we can consider a characteristic of radiation damage called an action spectrum. An action spectrum gives us a measure of the relative effectiveness of radiation in generating a certain biological response over a range of wavelengths. This response might be erythema (sunburn), changes in plant growth, or changes in molecular DNA. Certain wavelengths of UV radiation have a much greater probability of DNA damage than others. 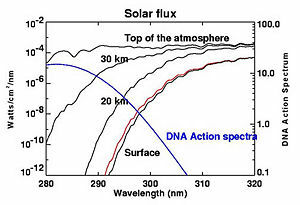 Fortunately, where DNA is easily damaged, such as by wavelengths shorter than 290 nm, ozone strongly absorbs UV. At the longer wavelengths where ozone absorbs weakly, DNA damage is less likely. The thickness of the ozone layer—that is, the total amount of ozone in a column overhead—varies by a large factor worldwide, being in general smaller near the equator and larger as one moves towards the poles. It also varies with season, being in general thicker during the spring and thinner during the autumn in the northern hemisphere. The reasons for this latitude and seasonal dependence are complicated, involving atmospheric circulation patterns as well as solar intensity. Since stratospheric ozone is produced by solar UV radiation, one might expect to find the highest ozone levels over the tropics and the lowest over polar regions. The same argument would lead one to expect the highest ozone levels in the summer and the lowest in the winter. The observed behavior is very different: most of the ozone is found in the mid-to-high latitudes of the northern and southern hemispheres, and the highest levels are found in the spring, not summer, and the lowest in the autumn, not winter in the northern hemisphere. During winter, the ozone layer actually increases in depth. This puzzle is explained by the prevailing stratospheric wind patterns, known as the Brewer-Dobson circulation. While most of the ozone is indeed created over the tropics, the stratospheric circulation then transports it poleward and downward to the lower stratosphere of the high latitudes. However in the southern hemisphere, owing to the ozone hole phenomenon, the lowest amounts of column ozone found anywhere in the world are over the Antarctic in the southern spring period of September and October. Brewer-Dobson circulation in the ozone layer. The ozone layer is higher in altitude in the tropics, and lower in altitude in the extratropics, especially in the polar regions. This altitude variation of ozone results from the slow circulation that lifts the ozone-poor air out of the troposphere into the stratosphere. As this air slowly rises in the tropics, ozone is produced by the overhead sun which photolyzes oxygen molecules. As this slow circulation bends towards the mid-latitudes, it carries the ozone-rich air from the tropical middle stratosphere to the mid-and-high latitudes lower stratosphere. The high ozone concentrations at high latitudes are due to the accumulation of ozone at lower altitudes. The Brewer-Dobson circulation moves very slowly. The time needed to lift an air parcel from the tropical tropopause near 16 km (50,000 ft) to 20 km is about four to five months (about 30 feet (9.1 m) per day). Even though ozone in the lower tropical stratosphere is produced at a very slow rate, the lifting circulation is so slow that ozone can build up to relatively high levels by the time it reaches 26 km. Ozone amounts over the continental United States (25°N to 49°N) are highest in the northern spring (April and May). These ozone amounts fall over the course of the summer to their lowest amounts in October, and then rise again over the course of the winter. Again, wind transport of ozone is principally responsible for the seasonal evolution of these higher latitude ozone patterns. The total column amount of ozone generally increases as we move from the tropics to higher latitudes in both hemispheres. However, the overall column amounts are greater in the northern hemisphere high latitudes than in the southern hemisphere high latitudes. In addition, while the highest amounts of column ozone over the Arctic occur in the northern spring (March-April), the opposite is true over the Antarctic, where the lowest amounts of column ozone occur in the southern spring (September-October). Indeed, the highest amounts of column ozone anywhere in the world are found over the Arctic region during the northern spring period of March and April. The amounts then decrease over the course of the northern summer. Meanwhile, the lowest amounts of column ozone anywhere in the world are found over the Antarctic in the southern spring period of September and October, owing to the ozone hole phenomenon. 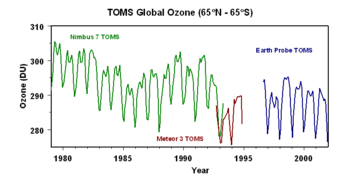 Global monthly average total ozone amount showing depletion since 1980. The ozone layer can be depleted by free radical catalysts, including nitric oxide (NO), hydroxyl (OH), atomic chlorine (Cl), and atomic bromine (Br). While there are natural sources for all of these species, the concentrations of chlorine and bromine have increased markedly in recent years due to the release of large quantities of manmade organohalogen compounds, especially chlorofluorocarbons (CFCs) and bromofluorocarbons. These highly stable compounds are capable of surviving the rise to the stratosphere, where Cl and Br radicals are liberated by the action of ultraviolet light. Each radical is then free to initiate and catalyze a chain reaction capable of breaking down over 100,000 ozone molecules. Ozone levels, over the northern hemisphere, have been dropping by four percent per decade. Over approximately five percent of the Earth's surface, around the north and south poles, much larger (but seasonal) declines have been seen; these are the ozone holes. On January 23, 1978, Sweden became the first nation to ban CFC-containing aerosol sprays that are thought to damage the ozone layer. A few other countries, including the United States, Canada, and Norway, followed suit later that year, but the European Community rejected an analogous proposal. Even in the U.S., chlorofluorocarbons continued to be used in other applications, such as refrigeration and industrial cleaning, until after the discovery of the Antarctic ozone hole in 1985. After negotiation of an international treaty (the Montreal Protocol), CFC production was sharply limited beginning in 1987 and phased out completely by 1996. On August 2, 2003, scientists announced that the depletion of the ozone layer may be slowing down due to the international ban on CFCs. Three satellites and three ground stations confirmed that the upper atmosphere ozone depletion rate has slowed down significantly during the past decade. The study was organized by the American Geophysical Union. Some breakdown can be expected to continue due to CFCs used by nations which have not banned them, and due to gases which are already in the stratosphere. CFCs have very long atmospheric lifetimes, ranging from 50 to over 100 years, so the final recovery of the ozone layer is expected to require several lifetimes. Compounds containing C–H bonds have been designed to replace the function of CFC's (such as HCFC), since these compounds are more reactive and less likely to survive long enough in the atmosphere to reach the stratosphere where they could affect the ozone layer. However, while being less damaging than CFC's, HCFC's have an ozone depleting potential of between 0.01 and 0.1, meaning that HCFC's also have a significant negative impact on the ozone layer. HCFC's are therefore also being phased out. ↑ 1.0 1.1 The Ozone layer. Retrieved November 25, 2008. ↑ Science: Ozone Basics. Retrieved November 25, 2008. ↑ Energy Information Administration/Emissions of Greenhouse Gases in the United States 1996. Halocarbons and Other Gases. Retrieved November 25, 2008. ↑ Independent Online. Independent Online. Retrieved November 25, 2008. ↑ US EPA. Ozone Depletion Glossary. Retrieved November 25, 2008. All links retrieved January 8, 2019. This page was last modified on 8 January 2019, at 21:26.